Mr. V. was saying he felt like a little cold was coming on the other day. We've gotten a LOT of rain, you see, and he is outside in it working hard. That’s just life on the homestead! It's so easy to whip up an immune-boosting soup recipe using basic ingredients along with anti-imflammatory and healing herbs and spices. What's great about using herbal spices in soups to support the body is that they do double duty! Herbs not only taste great, but their medicinal properties can't be beat. For this soup, I decided to use ground beef because that's what I had already taken out. Mr. V. loves Southwest flavor, so I combined those tastes with proven cold-fighting herbs. This soup turned out to be incredibly tasty, warming, nourishing, and soothing. He felt better the very next day. This is a happy, colorful soup that's great any time, too. You can also make it in one single pot, saving you time in the clean-up. I make this soup often just because it's so danged good! It's also a healthy and inexpensive way to start feeling better if you feel a cold coming on. Give this a try if you're feeling under the weather, if you want a Southwest vibe and a beautiful, colorful soup, or if it's dead of Winter and you're cold. It's an easy one-pot soup recipe too, which makes it even more attractive to busy folks like me. FTC Disclosure: There are affiliate links scattered throughout this article. If you click through and make any kind of purchase, I may earn a small commission at no extra cost to you. Full Disclosure Here. You are just going to love this one-pot Southwest soup for both its taste, how easy it is, and it will help you heal up quickly from a cold! You're welcome! I feel so very fortunate! In the past two months since Mr. V. and I moved to Idaho, we have sorely lamented the lack of healthy, grass-fed meats in the local grocery stores. We lost our freezer in the move, and along with it a ton of good meat. We are fortunate because we met some friends down the hill who raise GRASS-FED beef. Now we are loving life! I did use a lot more onion than I normally use in soups because it was primarily for healing. Just add more or less to your own taste. This is a lot of turmeric powder. However, it is balanced well with the Cumin, and even got a thumbs up from my daughter visiting from college. It's a wonderful immune boosting herb. NOTE: I buy most of my bulk herbs, especially the medicinal ones, from Starwest Botanicals. They have a huge selection of organic herbs and teas for both culinary and medicinal use. If you want your Turmeric supplementation to absorb into your body well, you need to add in plenty of Black Pepper. Plus, it helps you sweat, in case you are experiencing a dry fever. I used Cumin for the delicious Southwest flavor, but it also has healing properties. A little goes a long way, so I limited it to 1/2 tsp. But, you could add more if you really like the flavor. That's a lot of garlic, and honestly, I could have added it more. It went very well with the spices mentioned above and didn't overpower anything. Garlic is one of the BEST immune boosting herbs you can ingest if you aren't feeling well. It also helps kill worms and parasites. Just saying. I love using fresh tomatoes, and I actually used a combination of both canned and fresh in this recipe. I really try to go lightly on using canned commercial goods, unless they are in a BPA free can--hard to find. You can read about Foods You Think Are Healthy But are Really Killing You here. I make our own beef, chicken, and vegetable broths, and I package them in quart or 2 quart amounts. You can find out how to make your own broth here, or buy organic broth. That's just fine, too. I'm not crazy that it's canned, but Mr. V. loves hominy. I thought it would go well in this soup, and it sure did! You could substitute with frozen corn, gluten free rice noodles, even tortilla chips would be great! I didn't actually have celery on hand in these photos, but if I had, I would have used them for their cooling and diuretic properties. Very detoxifying. Adding greens that wilt to nothing like spinach is a great way to get greens into your family's food. Cilantro has an excellent Southwest Flavor. It's also very diuretic. Mr. V. happens to love the stuff, so I added quite a bit. You could leave it out all together or reduce it if you don't like it, though. It seems it's a love-hate flavor. Just look at that gorgeous Cilantro! 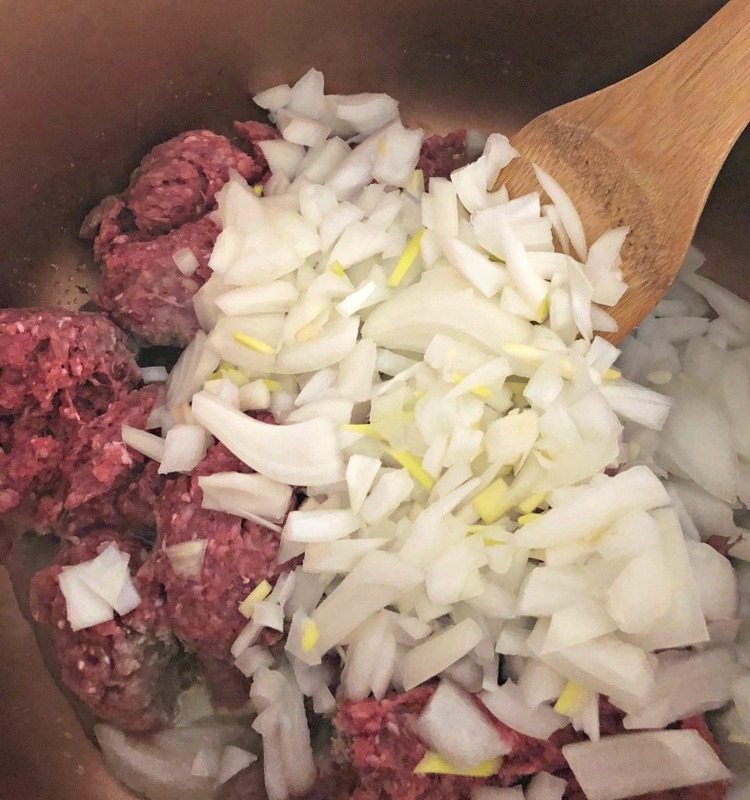 In a large pan that is big enough for liquid, brown your ground beef. Go ahead and add the onions now, too, so that they have a chance to become translucent and add all that good flavor and medicinal goodness. Add all the spices & celery (not the Cilantro, which is mostly for a garnish on top at the end). Let this cook for about five minutes, stirring well. Simmer the beef & spices in the broth for about 30 minutes. The longer it simmers, the more the broth will reduce, and that's fine if you don't want a lot of liquid. When you are about 15 minutes out from eating your soup, go ahead and add the hominy & spinach. The spinach will wilt nicely, and the hominy will take on the color of the turmeric, becoming a lovely yellow color. Isn't this Immune-Boosting Soup looking better and better? Step 5) Serve and Enjoy! If you are adding the cilantro, go ahead and add it on top of the soup. You could also add avocado if you like right now, too. Here it is: Delicious One-Pot Immune-Boosting Southwest Soup! Enjoy! That's a mouthful, right? I'm not too great at coming up with names for my food concoctions, but I CAN tell you this soup is delicious and is filled with herbs and spices that will help you get over that little cold fast. It's so easy, too! Do you have a favorite immune-boosting soup combination you like to make? We'd love to hear your favorites! Leave comments in the comments section for us! P.S. If you haven't done so yet, I hope you'll sign up for our newsletter! You'll never miss a thing, and you’ll get free access to the Resource Library! You’ll love what’s inside! Disclaimer: I am not a medical doctor. In no manner, stated or implied, is any statement in this article meant to diagnose, treat, cure, or prevent any disease. Please seek medical advice from your doctor or medical professional if you have questions. I just love a great-tasting, one-pot, immune-boosting soup any time of the year! Oct 9 How to Make Pumpkin & Ground Beef Soup: Perfect for Fall, It's an Easy One Pot Recipe!